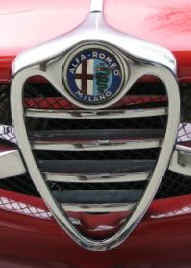 I have been a fan of Alfa Romeo since I was a wee young lad. I recall sitting at Kyalami and watching Alfas fight with Capri’s, Anglias, Dauphines, Gordinis, Escorts, Cortinas, 2002’s and the like. Recently I was looking through some photos and came across a picture that reminded me of that special time in my life. I decided that I had to get me a GTV. 1971 was the target year but anything from 69 to 74 would do. I looked in my price range and condition level for two years. I found a red 71 that was tricked and looked fabulous. I bough it. The owner stated that the car was rust free and I had the car inspected by a reputable Alfa shop in San Diego who also reported that the car was rust free. Low and behold the entire front end was rotting which was discovered after I had a chance to spend some time under the car. The car went back and I got my money back. There is this thing called “Fraud by Inducement”. It’s a legal term to protect you from a seller saying don’t worry about this, it cool, and you believing him/her. This seller committed this with possible collusion to commit fraud by the Alfa Shop. Buyer beware! A nasty taste in my mouth in my quest to own one of my most favorite motor vehicles of all time. Anyhow after another lengthy period of search I decided that I would rather buy a known quantity than risk someone else’s attempts. I bought a 1974 GTV as a rolling chassis. The car has had two previous owners. The original owner bought the car in 1974 and sold it in February 1980 to the second owner who owned the car effectively until I bough it. It is and always has been a Californian car. Approximately two years before I bough it, it was purchased by an individual as a project. He stripped the car of the interior and mechanicals and claims to have had it stripped to bare metal and then repainted. He reported that the body shop that was doing the work went insolvent and that he recovered the car from the body shop he used prior to them completing all the bodywork. It sat in his yard for nearly a year in this state. I purchased the car as it was. What am I doing to the car? Well, this car is not going to be a concourse vehicle. I am not spending enough on the restoration and I want the car to have specific upgrades. The car had a factory air conditioner – It’s not going back in. It was not originally silver, but its staying silver. The majority of the modifications that I am doing to the car are performance based. From the outside it will look like a stock 1974 GTV. I am retaining the original side markers, lights and badging. The car will sit lower since I am replacing the entire suspension. Dash is being restored by Just Dashes to a new condition. New interior including insulation, carpet, headliner, panels, etc. All rubber seals and boots will be new. All trims and moldings will be replaced with new ones. The front and back bumpers will be polished. New badges will be installed on the car. The wheels will be cleaned and re-finished. A new brake master cylinder and brake pads will be installed. New brake lines will be installed. New clutch master and slave cylinders will be installed. A new clutch assembly will be installed. A new water pump will be installed. The Synchro’s, bearings and front and rear transmission seals will be replaced. The differential seal will be replaced. A new exhaust system will be installed. A dual Weber conversion kit will be installed to Euro Specs including the Euro airbox. A new fuel line will be installed. A new distributor cap, rotor, condenser, coil, spark plugs and wire set will be installed. New hoses and belts will be installed. All new filters will be provided. The suspension will be lowered by 1 to 2 inches. The work has begun. It is taking a lot more time that I ever imagined. I am getting somewhat frustrated but am committed to the project over my head!